OpenMarket customers who use US short codes enjoy a reliable SMS service with great throughput potential. However, there are some mobile subscribers that just can’t be reached via short codes. In this blog post, we will explore some common reasons why the message doesn’t arrive – and describe some strategies that can help ensure your message always gets there. Also included: some helpful cat pictures. In some cases, end users on a mobile virtual network operator (MVNO) carrier cannot receive short code messaging. Our recommendation in this case is two-fold. Though the installed user base among MVNOs represents a relatively small market share, being able to reach all of your users, regardless of their carrier, will ensure the best customer experiences. First, identify the portion of your user base which may be using these carriers (for example, through an operator lookup). Second, send your messages to these users with an alternate originator. SMS messages sent via text-enabled toll-free numbers can reach more carriers than short codes, so they are great for reaching the audience that short codes cannot. Case Closed: Using text-enabled toll-free messaging as a back-up solution. One recent scenario of an OpenMarket customer resulted in this company being able to extend the reach of their SMS campaign by almost 3%, by simply text-enabling an existing toll-free number. This customer uses the text-enabled toll-free number to reach their clients who cannot receive short code messages. Thanks to US Number Portability, since 2003 your end users are able to easily switch carriers, usually in less than an hour. If you are storing your end user carrier ID information in your database, and passing the carrier ID along with each SMS message request, you might actually be trying to send the message to the wrong carrier. If this is indeed the culprit, you will receive a delivery receipt code indicating that the phone number is no longer valid. In order to sort through this, the best advice is to refresh the carrier ID information by perform a . If the results provide a new carrier ID, try sending the message again with the new carrier ID. If the results do not change, then you can also try another messaging originator (short code, long code, etc.) as described above in Likely Suspect #1. Case Closed: Using operator lookup occasionally to refresh your carrier ID information will help ensure your user data is up-to-date and that you can reach your end-users, even if they port their numbers. In another recent example, an OpenMarket customer was able to refresh carrier ID values for messages that had been failing, with a success rate of 75% of those failed messages. Got a case that needs investigating? Ask your OpenMarket Account Manager for assistance in employing these strategies and other specific advice that will help you maximize the reach of your SMS customer experiences. 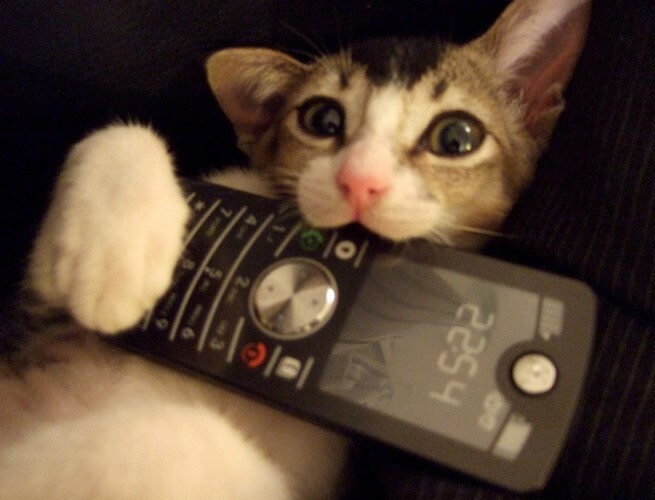 In conclusion, here is a picture of a cat using a cellphone. This kitty cat loves his phone.